I made first person model in blender. It also has animations in it. Most of animation works fine, but in some cases, Unity's keyframe interpolation makes wrong result. Note that animation was made by 60 frames per second in Blender. As you can see there are two magazines. Each named Mag1 and Mag2 and Mag1 is the magazine that attached to the gun. 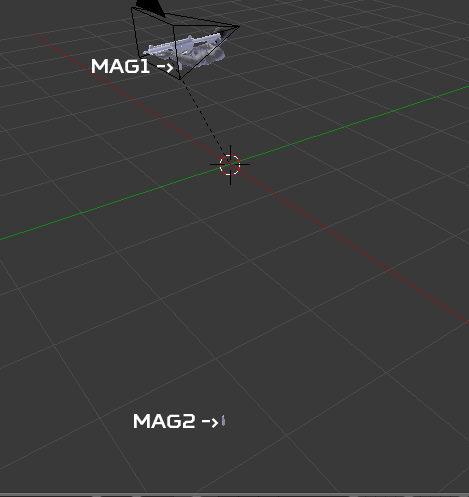 Mag2 is always located very bottom of the screen so that it is impossible to see, except reloading animation. While reloading, first pull out the mag1 from the gun and put in the mag2 to the gun. And here is the trick, after mag2 is attached to a gun, hand put the mag1 somewhere, maybe magazine pouch. Anyway as soon as mag1 disappeared from the screen, it switches mag1 and mag2 immediately at only single frame. So mag1 is now move back to the gun and mag2 is also reloated to bottom. In Blender, it seems nothing wrong but in Unity is quite different. As soon as mag1 disappeared, it doesn't switched immediately and it moves smoothly animated so I can see that magazines were moved. I'm pretty sure that this happens maybe Unity interpolates keyframes. I already turned off Animation Compression option and resample curves, but still won't worked. I struggled this issue almost a year and still figuring out how to fix it, and I think it's time to solve it. Any advice will very appreciate it. Browse other questions tagged unity animation blender frame-rate interpolation or ask your own question. How do I put duplicated, modified animation clip into original model?